Get Christmas cards ideas here and send homemade Christmas greetings to everyone this Christmas. Wishing You Many Hours Of Happy Card Making This Christmas! Stamp the snowman stamp image on white paper with red pigment ink. Sprinkle gold embossing powder on image. Then shake off loose powder. Use a heat-gun to melt the embossing powder. Color in with markers/watercolor or any coloring media of your choice. Cut out the image and layer on colored papers. Then finally on your basic blank card. Write Merry Christmas with gold marker. Stamp the snowflake image on vellum with Versamark ink. Sprinkle silver embossing powder on the image. Shake off loose powder and melt with heat-gun. Using a pin, make tiny holes on the red parts as shown in photo on the left. Dry emboss on the white parts (refer to the photo) and color in with markers. Cut out embossed snowflake image and attach to a dark green cardstock. 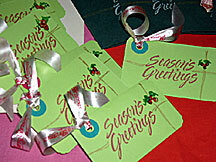 Stamp Season's Greetings on botton of snowflake with Brilliance Moonlight White inkpad. Stamp Season's Greetings on evergreen cards with red pigment ink. Draw in cherries and leaves. Use corner punch to decorate the four corners. Punch a hole on top left corner and tie a ribbon. Click here to upload your homemade Christmas card and share your story!